Facultative upland plant, early to mid successional colonizer. Seed or cutting very successful, and both very cheap. 2. Luna, Tara; Wick, Dale. 2004. Propagation protocol for production of container Sorbus scopulina Greene var. scopulina Greene plants (172 ml containers); Glacier National Park, West Glacier, Montana. In: Native Plant Network. URL: http://www.nativeplantnetwork.org (accessed 8 May 2005). Moscow (ID): University of Idaho, College of Natural Resources, Forest Research Nursery. 3. Luna, Tara; Hosokawa, Joy. 2001. 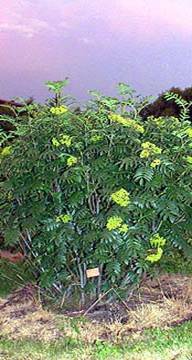 Propagation protocol for vegetative production of container Sorbus scopulina Greene var. scopulina Greene plants (800 ml containers); Glacier National Park, West Glacier, Montana. In: Native Plant Network. URL: http://www.nativeplantnetwork.org (accessed 8 May 2005). Moscow (ID): University of Idaho, College of Natural Resources, Forest Research Nursery. 4. Zeidler, Scott; Justin, John. 2003. Propagation protocol for production of field-grown Sorbus scopulina Greene plants (2+0); Lone Peak Nursery,Utah Division of Forestry, Fire and State Land, Draper, Utah. In: Native Plant Network. URL: http://www.nativeplantnetwork.org (accessed 8 May 2005). Moscow (ID): University of Idaho, College of Natural Resources, Forest Research Nursery.